This recipe is inspired by these delicious, though non-Paleo, crisps/crackers Scott and I enjoyed while in Portland. I'm working on a Paleo-friendly cracker to satisfy our cravings, but in the meantime I decided to modify this recipe, from Elana's Pantry. The flavor combination is amazing! Sorry I didn't see this comment sooner. 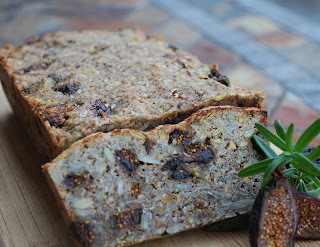 There are a ton of flavor combinations that would work with this bread...hazelnuts, dates, and cinnamon sounds great! Let me know how it turned out and thank you for checking out my blog! Hello, I love this bread. I also sliced some real thin and dried it out in the oven like for biscotti. I'm looking for a tasty cracker to. It turned out o.k not as crisp as I'd hoped for but still delicious. might work...I'll plan to try this over the weekend and let you know. :) I'm glad you tried this bread and enjoyed it...I do too!